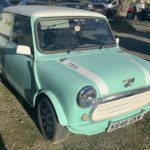 Hello everyone, I have just joined as we have just bought a ‘93 K reg Cooper (for my 15 year old to learn to drive in when she is 17 next year - honest). It needs a lot of work including a new floor and front end as it currently has s plastic front on it ? 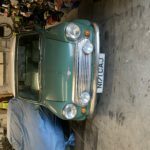 I have been away from the Mini universe since I sold my B reg Mayfai when I went to uni in the 90’s (idiot move) but hope to use my parents knowledge as they had dozens of Minis for auto testing etc in the early ‘70s. Here is our Cooper as it stands now! Well done on taking the plunge! My daughter would love that colour! Mine prefers pink and purple! Slight change of plan. We now have 2.5 Coopers as a MG Car Club friend of my parents has sold us the Minis he recently bought! Going to sort this one for keeping as it is a 35th Anniversary limited edition, and sell the K plate one once we have got it road legal again.